The new State of Downtown Wichita report for 2017 is missing something. What is it, and why is it missing? When you’re Jeff Fluhr, you don’t spend much time in park — it’s usually full speed ahead. It was no different when a couple of members of the Wichita Business Journal’s newsroom visited with the president of Downtown Wichita and the Greater Wichita Partnership in early October. The new report is something better than before. 2 Actually, it’s what is left out that marks a step forward for Downtown Wichita, which is the new name for the Wichita Downtown Development Corporation. Previous versions of the report prominently mentioned the number of daytime workers in downtown Wichita. 3The number most often given was 26,000. But that number is missing from this year’s report. Unless I overlooked it, there is no mention of the number of workers in downtown Wichita. 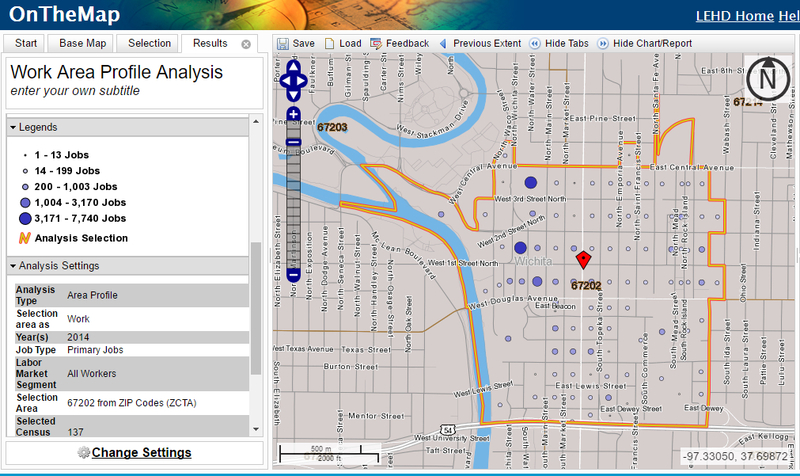 The Census Bureau OnTheMap application for downtown Wichita, zip code 67202. Click for larger. LODES data for census block 201730043001036, showing 7,740 workers. Here’s what concerns me. 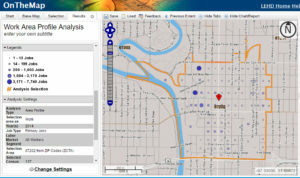 This data comes from a Census Bureau application called “OnTheMap.” When using the OnTheMap application for downtown Wichita, which is zip code 67202, there are two large bright blue dots that stand out from all others. These represent the two highest concentrations of workers in downtown Wichita. One is Census block 201730043001036, which has 7,740 employees. This is a one square block area from First to Second Streets, and Wichita to Water Streets. 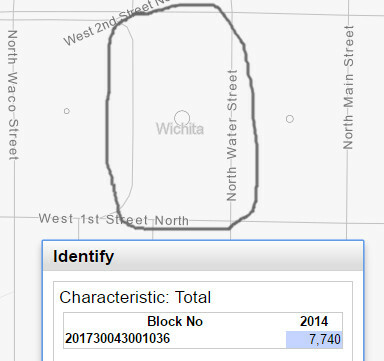 That block, for the year of this data, held the Wichita school district headquarters building. 7,740 employees is a lot. It’s about one-fourth of the total downtown employee count claimed by Downtown Wichita and CEDBR. It’s more employees than McConnell Air Force Base has, and about twice as many that work at Koch Industries in Wichita. Importantly, this number is eleven times the number that work at Cargill, a company which Wichita is granting many millions of dollars in incentives just to retain the company in Wichita. 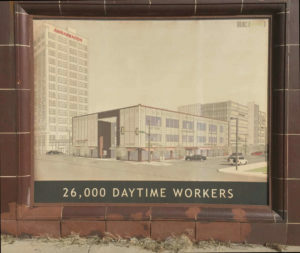 Promotional material on the former Henry’s building. Click for larger. We just have to wonder: Didn’t anyone look at this data in a serious and critical manner? A quick glance at the data by CEDBR, much less “systematically” checking for “reasonableness” should have led to questions. A quick look by Downtown Wichita staff should have spurred these inquiries: Who do all these people work for in that one block? This is a wonderful success story! How can we replicate this great accomplishment in other blocks in downtown Wichita? And didn’t anyone at the City of Wichita — council members and bureaucrats alike — wonder about these numbers? That didn’t happen. Or maybe it did, and someone in authority nonetheless decided to proceed to use a statistic that doesn’t mean what city leaders say it means. That’s why I wrote it was seemingly reasonable for Fluhr to refer me to CEDBR with my questions about the data. In retrospect, it is clear this is a multi-year episode of incompetence, ineptitude, or dishonesty. But at least this statistic is no longer used. I asked Cindy Claycomb, who is Chair of the Executive Committee of Downtown Wichita, about this. 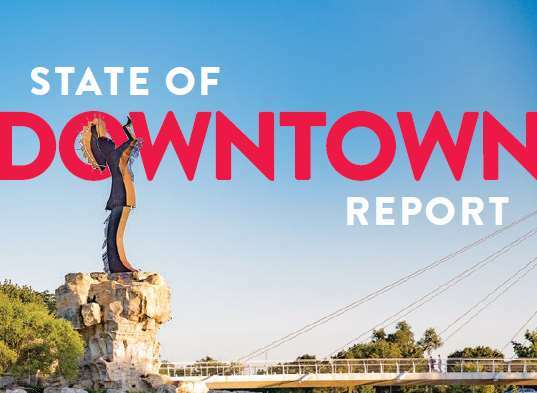 She replied that all data sources are listed in the report, and that the board relies on the expertise of the Wichita Downtown Development Corporation staff to decide what is presented in each year’s report. She said Jeff Fluhr was the best person to address my concerns. He, as we saw, demurred to CEDBR at WSU. 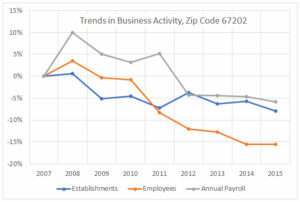 Trends of business activity in downtown Wichita. Click for larger.